Hallberg-Rassy Parts supply a lot of new sails to Hallberg-Rassy boats. All over the world. 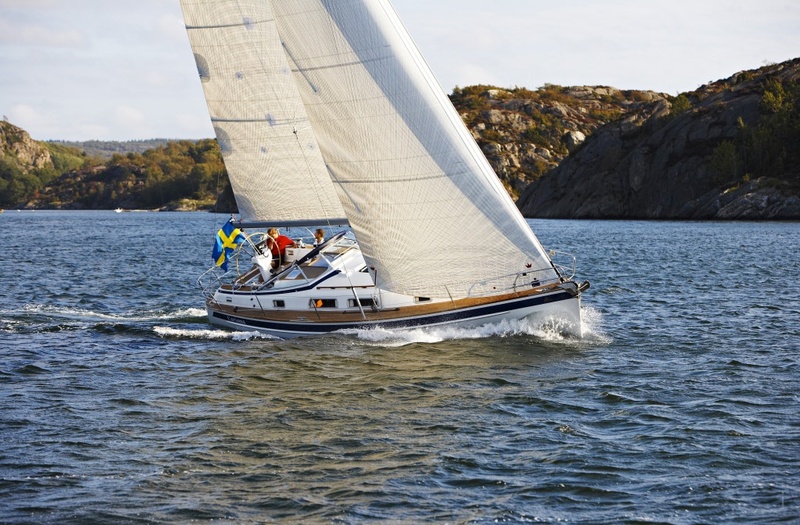 We know the boat data for all Hallberg-Rassy boats from early 1990's and can produce sails without having to visit the boat prior to production. 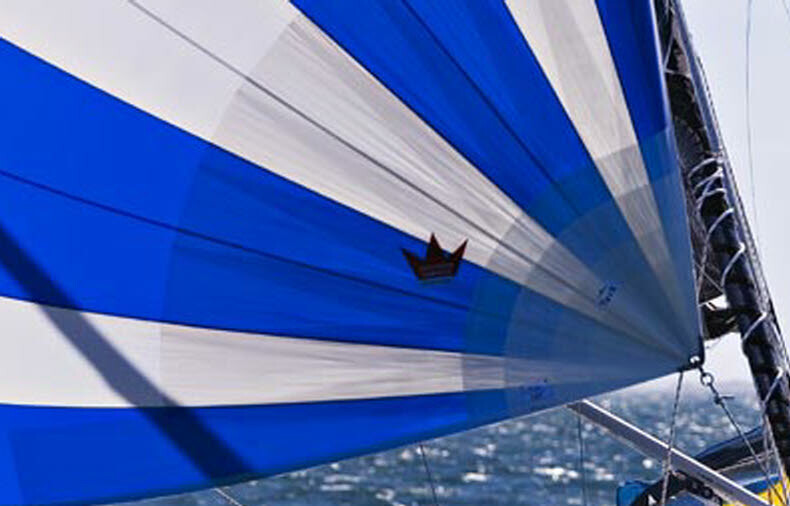 Knowing all boat data also results in being able to produce sails to the perfect specification. 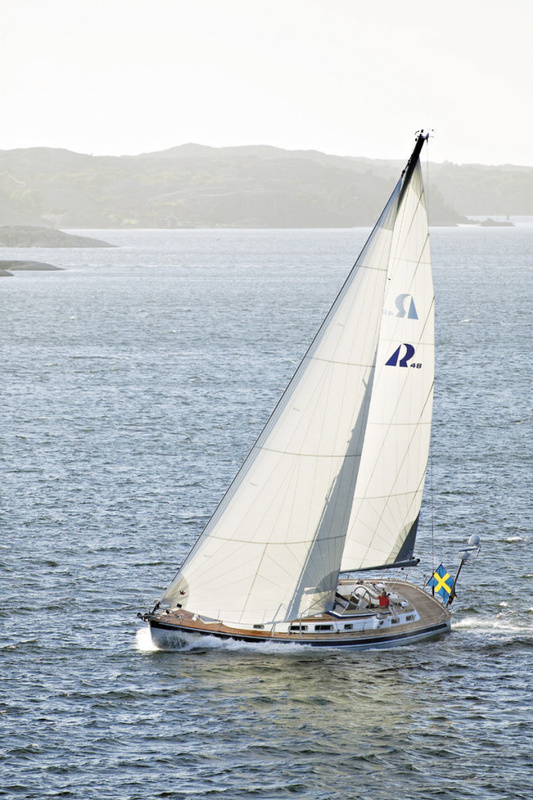 The latest generation cruising sails Elvströms offers is Epex. Difference compared with traditional panel sails, made of woven panels sewed together, is that Epex is a membrane sail that has its fibers in the optimal direction over the entire sail. A computer calculates the fiber intensity and calculate the pattern the fibers should be laid out. Epex gives both ideal diversification of loads and a really high stability and shape. We can offer all blends of fibers on demand. But our recommended option is the mix of Vectran and Technora fibers. 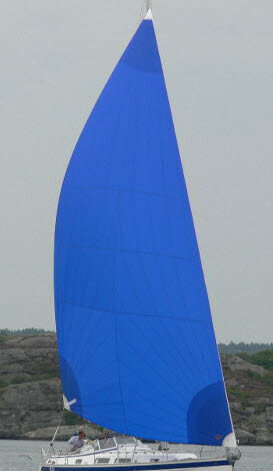 Stabilized and protected by a layer of Tafetta to both sides of the sail. Vectran is a light yellow coloured fiber that has an extraordinary capability to catch flex and it is very resistant against UV. A good capability to catch flex makes the sail less sensitive for flogging and damage. This gives the sail a longer life time. The low stretch in a Epex sail is a big advance in a cruising sail because you get less heeling and more speed, and you don’t need to reef a Epex sail as early as a normal sail. Technora is a black coloured fiber, that has an extremely low stretch. Compared to Dacron the stretch is four to five times less. Each side there is a layer of Taffeta. All this combined, created a very good cruising sail. A combination Hallberg-Rassy has successfully offered for 10 years now. Robust, long life span and a very good sail shape all combined. Elvstrøm Sails is the largest sailmaker in Europe. 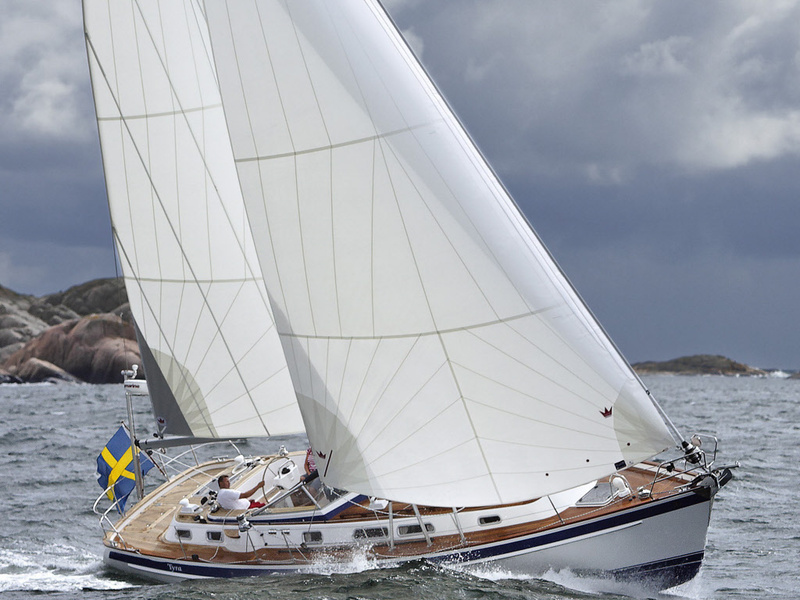 The sailmaker that has supplied sails to Hallberg-Rassy since the early 1990's. 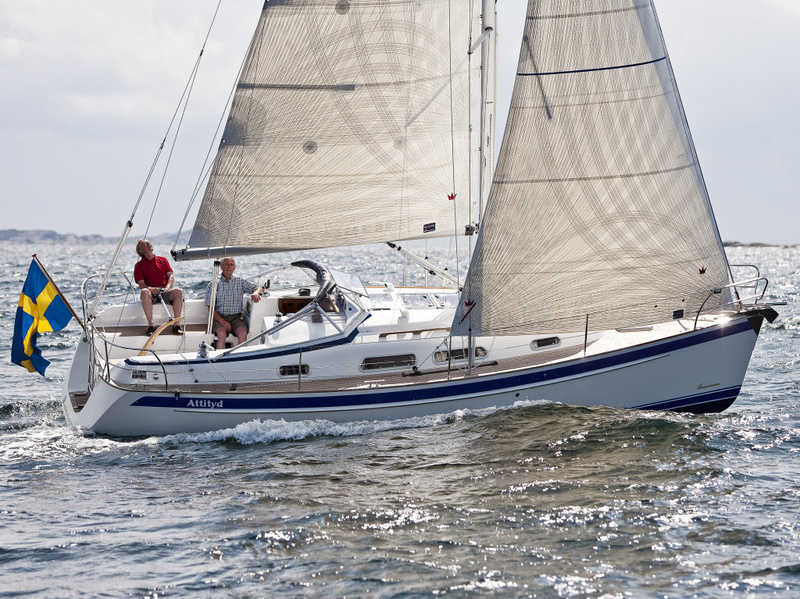 It is very difficult, not to say impossible, for a boat owner to compare offers from different sailmakers. Each sailmaker has their own ideas and names for different materials. It is almost impossible to get an offer with exactly the same cloth, same weight and finally same design. In order to reduce the uncertainty we offer only the Hallberg-Rassy Elvström Offshore quality. The Offshore line is designed for ocean sailing. Cloth and detail work are chosen for your safety. Dacron. The Basic sail cloth. HIgh Quality Dacron. Crosscut design. HydraNet is a good cloth for extended cruising. Crosscut design. This is a woven cloth with Spectra Polyester fibers. This unique combination will reduce the problem with mildew. Often referred to as the Blue Water Sailors favourite. 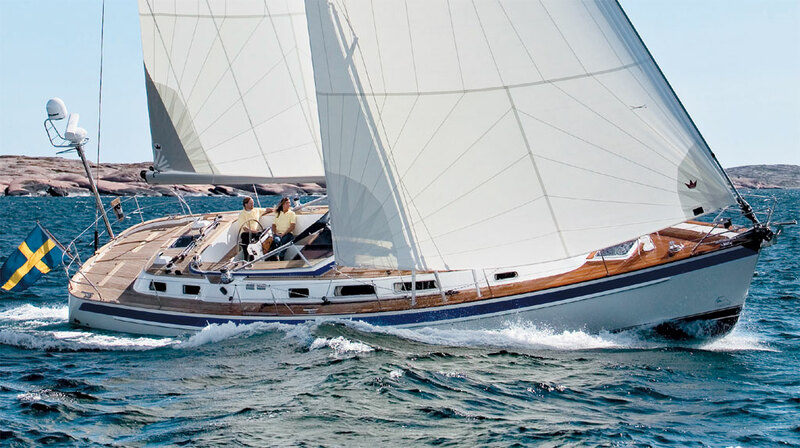 HydraNet RADIAL is a developed HydraNet cloth with fibers supporting the cloth construction in more directions which makes it possible to make a triradial sail design. The triradial sail design will offer both a bit more performance and sail shape as the panels can be laid out in a more optimal way, but will also offer the nice look of a triradial design. 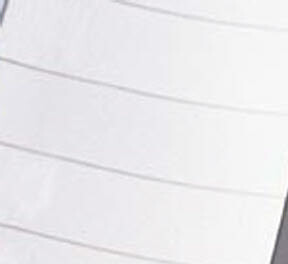 DCX Laminate is a laminated cloth made as triradial design. This is a laminated cloth that will give your boat increased performance to an attractive price. 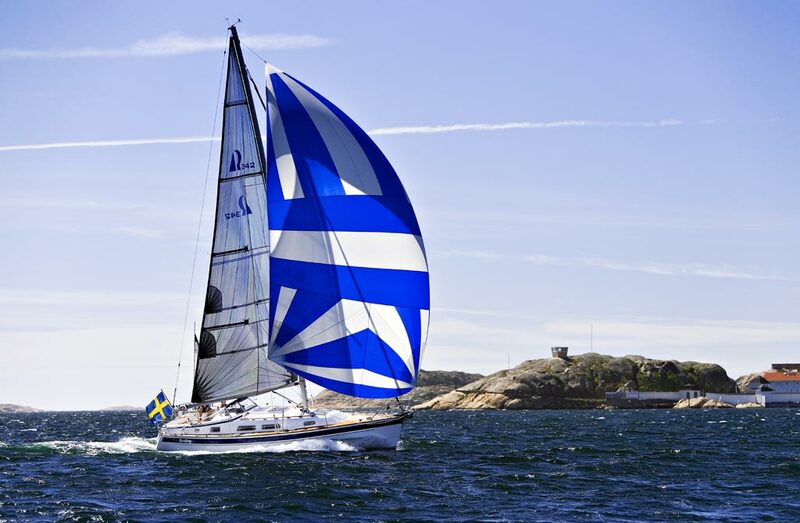 If you want to enjoy light wind sailing, invest in a spinnaker or an asymmetric spinnaker. 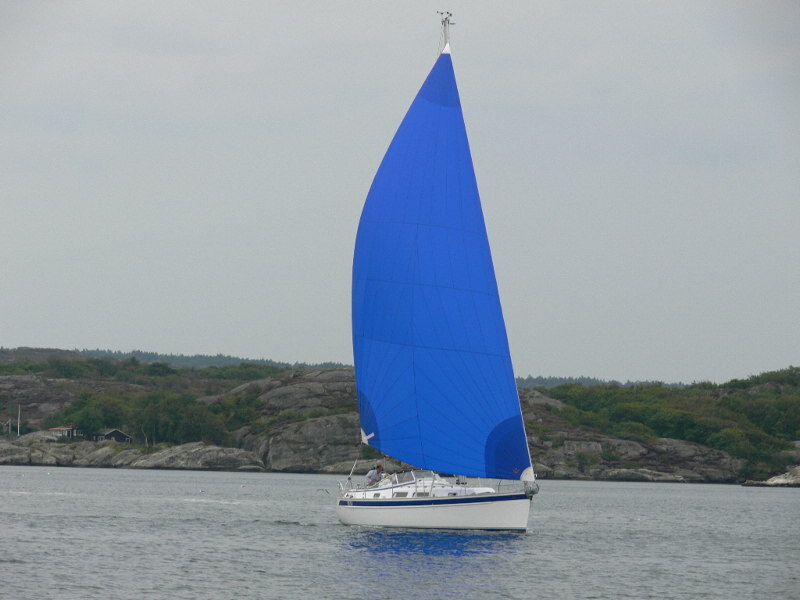 A Furling gennaker, code zero or a blue water runner on a removable bowsprit is handled very easy. Almost as easy to handle as the furling genoa.